Love your Patio Enclosures® Room? Know someone who is interested in adding a sunroom or enclosing a patio? Refer a friend and get $100 for each referral who meets with us to discuss their sunroom project. Plus, get an additional $100 for each referral that results in a sale. Earn up to $200 for simply telling your friends, neighbors and family about Patio Enclosures! 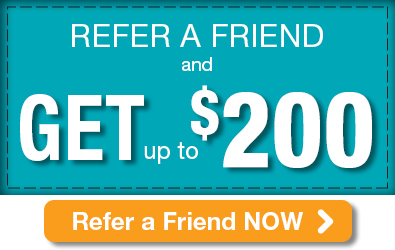 To refer your friend, call 1-800-230-8301 or fill out the online form by clicking on the button below. *Our Referral Program applies to screen rooms, sunrooms and solariums only. All we ask is that the referrals you provide be first time contacts with our company. Franchise and Dealer participation may vary.